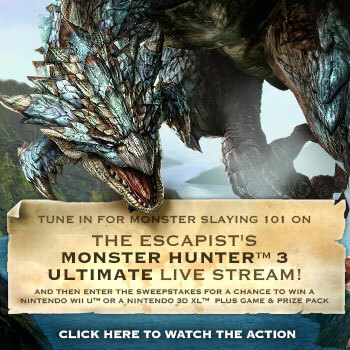 Play Monster Hunter 3 Ultimate with The Escapist and register for your chance to win great prizes! Livestream on June 19th and 21st. As part of this week's Monster Hunter 3 Ultimate promotion here on The Escapist, we're going to be giving away a Wii U and 3DS with copies of Monster Hunter for each. Additionally, we'll be giving away a few packs of Monster Hunter 3 Ultimate swag to some other lucky winners. You can enter once a day from the 19th through July 1st, so go ahead and put in your first entry today. The contest is open to United States residents only, but anyone can join in the livestream. Not familiar with Monster Hunter? Check out our review of the game or join us for our livestream where we tackle the basics of the series, as well as some later-game content. We'll be playing the game live right here on The Escapist on June 19th from 2 pm to 7 pm EST and on June 21st from 11 am to 4 pm EST. We'll start out each stream with a few hours of introductory play - if you've always been curious about Monster Hunter, but haven't ever taken the time to investigate, we're going to be playing through a sampler of the game's early hunts. Even if you're acquainted with the game already, we'll be bringing along a wide variety of weapons to try out, so you're bound to see a play style you're not familiar with. About halfway through the stream we'll transition over to online multiplayer, where you're invited to join us for some low to middle rank guild quests online - that means that you're welcome whether you got the game yesterday or even if you've been grinding away at G-Rank quests. If you haven't got the game yet, be sure to join us in the stream chat through the whole event so you can ask questions and interact with the streamers. Enter the Monster Hunter 3 Ultimate with Nintendo Wii-U or 3DS giveaway here and join us for the livestream on the 19th and 21st here.